Walmart’s journey from small-town five-and-dime to mother of all megastores. This timeline is part of Mother Jones‘ investigation into Walmart’s much-praised green makeover, for which reporter Andy Kroll traveled to China, the home of many of the retail giant’s manufacturers. He found that although Walmart claims to be monitoring its factories’ compliance with environmental and labor rules, its auditing system is plagued by corruption. What’s more, many factories outsource more than half their work to “shadow” factories—unregulated operations that auditors never visit at all. To read the full story, click here. 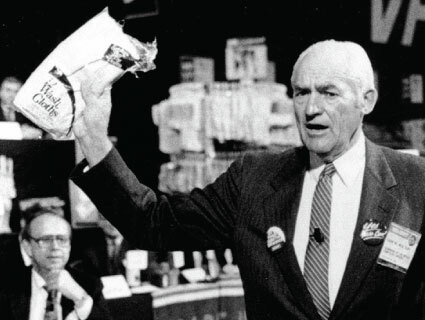 Sam Walton opens his first five-and-dime in Arkansas. Forbes reports that Walton, worth $2.8 billion, is the richest man in America. Some stores now feature oil change shops, banks, and salons. First foreign Walmart opens in Mexico City. President George H.W. Bush awards Walton the Medal of Freedom. Later that year, NBC Dateline reveals child labor at a Walmart supplier in Bangladesh. Walmart opens a prototype ecofriendly store in Kansas, featuring a man-made wetland and a roof made of sustainably harvested timber. The company starts selling goods made in China. Walmart opens its first store in China. 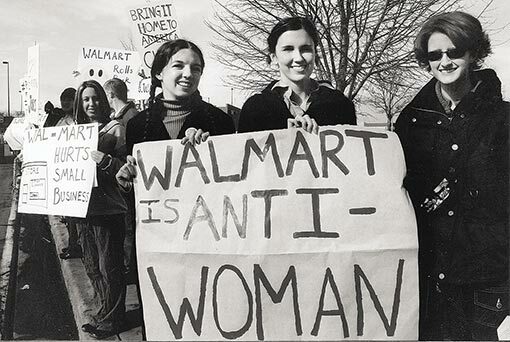 Walmart becomes the largest private employer in the world. In what will become the largest civil rights class-action case against a private employer in US history, six female employees file a discrimination lawsuit (PDF) against the company. The Supreme Court rejects class-action status for the suit in 2011 (PDF), effectively killing the case. An anonymous blogger launches WalMart-Blows.com. Its “Work for Wal-Mart? Need to vent?” forum garners 10,000 posts. 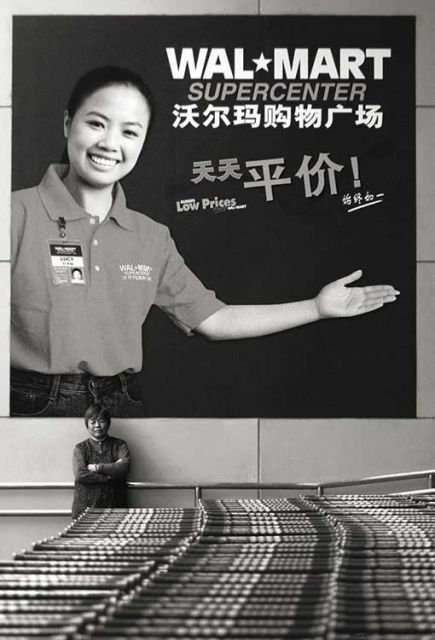 The Washington Post reports that in China, where 80% of the company’s suppliers are, Walmart’s factory employees work up to 80 hours a week and make as little as $75 a month. A leaked memo (PDF) reveals a Walmart HR exec’s proposal to “attract a healthier workforce” to cut back on health care costs. Federal investigators find that Walmart’s cleaning subcontractors hired 345 undocumented workers between 1998 and 2003. Walmart CEO Lee Scott says Walmart’s goal is to be 100% powered by renewable energy, create zero waste, and “sell products that sustain our resources and environment.” He doesn’t say by when. Walmart hires PR firm Edelman to launch a campaign around initiatives like increased starting pay, a $4 flat fee for generic prescription drugs, and a bargain organic foods line. A report from the Environmental Investigation Agency (PDF) finds that China produces 84% of Walmart’s wood products, a significant portion of which are sourced from illegal logging hot spots. Walmart rolls out a major initiative to reduce energy use and improve product safety in Chinese factories. It also changes its name from Wal-Mart to Walmart. Walmart announces it will cut 20 million metric tons of emissions from its supply chain by 2015. Walmart agrees to pay $27.6 million after illegally dumping hazardous waste in 42 California counties. At the urging of Michelle Obama, Walmart pledges to eliminate trans fats from its packaged foods and reduce sodium and sugar by 25% and 10%, respectively. Walmart has 357 stores, 30,000 factories, and 96,800 workers in China, where 70% of the products it sells are made (PDF). A New York Times investigation alleges that Walmart’s Mexico branch “has orchestrated a campaign of bribery to win market dominance.” Walmart is Mexico’s largest private employer, with 209,000 workers. CHART: How Many Sweatshops Does It Take to Make This T-Shirt?